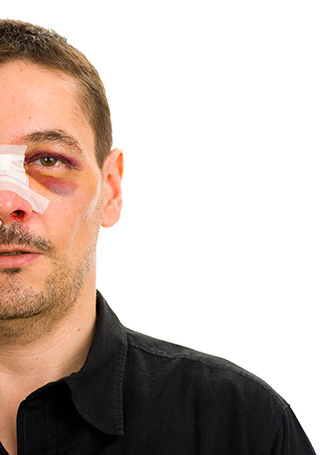 Approximately 40 percent of facial injuries in adults, teenagers or children involve the nose. Trauma or pressure injuries that lead to broken bones in the nose of younger children are relatively rare because the nasal region has extremely soft cartilage. This does not completely harden until someone is in their late teens. Other types of nose injuries can occur to children such as cuts, burns or bruising. Because the interior of the nasal passages have many capillaries under thin skin tissue, a bump on the outside of the nose or hard fall can lead to extensive bleeding. Occasionally, the interior nasal region begins to bleed due to a foreign object such as a pencil entering the area. A small crack in the bridge bone of the nose may not require a surgical procedure. If it is possible to stabilized it with a splint, bandages, and packing material, it can heal on its own. Patients are instructed not to wear eyeglasses or blow their noses for several days or weeks as this type of fracture heals. However, extensive trauma requires nose surgery from a specialist who knows how to repair the damage in order to maintain a proper airway along with creating an aesthetically pleasing nose. Maxillofacial specialists or otolaryngologists often perform rhinoplasty or nose surgery in addition to cosmetic or plastic surgeons.